All of us are born with a certain set of talents. These talents are decided on the basis of the day we are born. 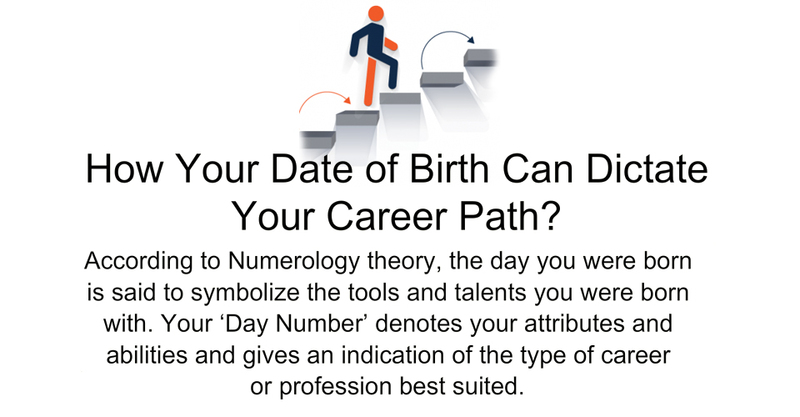 According to Numerology theory it is said that the inborn abilities and talents which you have in your share are related to the day you were born. To find out what your natural talents are and which career path is likely to suit you, continue reading. They live for attention and are born with excellent leadership qualities. These people would work best as composers, professors, teachers, veterinarians, ministers, psychologists, artists, dentists, healers, politicians, sportspeople, team leaders, fashion designers, doctors, chiropractors. Are soft and welcoming people who allow people to open up in front of them. Their best-suited professions are artists, technician, psychologist, spouse, healer, accountant/bookkeeper, co-ordinator, diplomat, banker/finances, radio. They are very expressive in nature and love to be heard. They don’t like being just ‘somebody’ in the world. The profession which suits them are motivators, coaches, writers, musicians, artistic endeavours – performing, parents, salespeople, communicators – all media, radio broadcasters, singers, performers, artists, actors, commentators, lecturers. They are hard working people. They are very motivated and desperately want to achieve their goal. They are amazing as Earth scientist, designer, gardener, builder, business owner, developer, lawyer, administrator, office worker, body-worker. The 4 person needs to work on behalf of others. They are the builder, natural mechanic. They are curious beings and are also great at bringing their thoughts forth. They excel at being social anthropologists, archaeologists, scientists, teachers, writers and historians, computer expert, public figure, speaker or lecturer, reporter, philosopher, salesperson, advertiser. The most loving and caring people. They could be parents, educators, caterer/restaurateur/gourmet cook, community services workers, councillors, advisors, consultants, ministers, healers, philosophers, artists, writers, nurses, masseur, naturopaths, health consultants, coaches of all kinds. Perfectionist by nature. They can be a good scientist, researcher, chemist, analyst, criminal detective, investigative work, professor, consultant, spiritual careers, minister, astrologer, analyst, earth/maritime occupations, occultist, healer, writer, actor, comedian. Have good sense of handling money and issues related to finance. They can be amazing business owner, publisher, contractor, engineer, financial analyst. They have a wild soul and the best professions for them are counsellor, minister, reverend, occultist, metaphysician, spiritual advisor, healer, involved in the literary field, designer, nurse, social worker, holistic health worker, composer, teacher, scientist, actor, artist, craftsperson, painter, architect, diplomat, world/community leader. Born with boss qualities. They can be manager, executive, CEO, team leadership, supervisors, surgeon, doctor, quality control inspector, consultant.